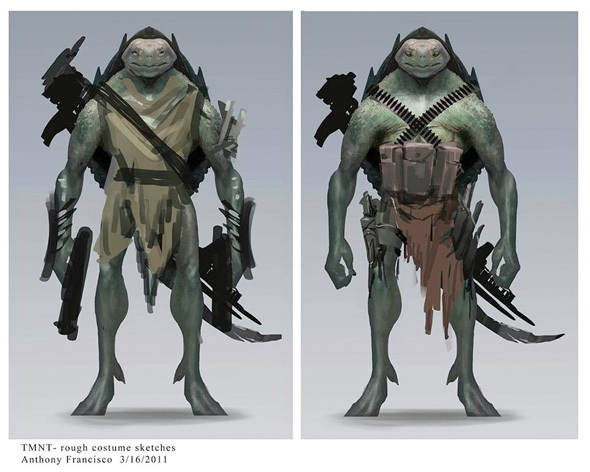 Shortly after Teenage Mutant Ninja Turtles hit theaters a few weeks ago, and hitting the box office so hard that they're already guaranteed a sequel coming in 2016, some rejected concept art for the new designs of the turtles surfaced showing that things could have been much worse. The new designs still ended up causing some grief amongst fans, but again, we'd like to show you how terrible some of the other designs were so we can be somewhat grateful for the final character design. 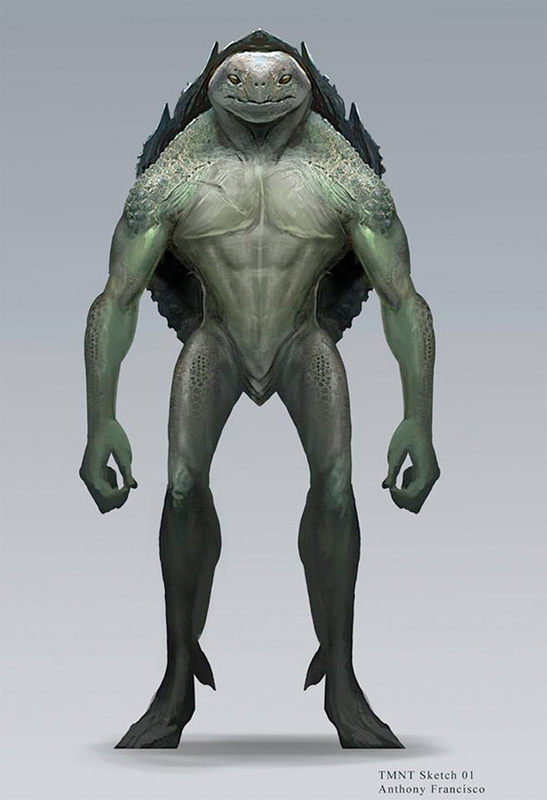 Some new rejected concept art has surfaced from Anthony Francisco (who worked on Guardians of the Galaxy) and their designs are just weird, making them look almost like traditional aliens with shells, ready to eat children on pizza. Look! 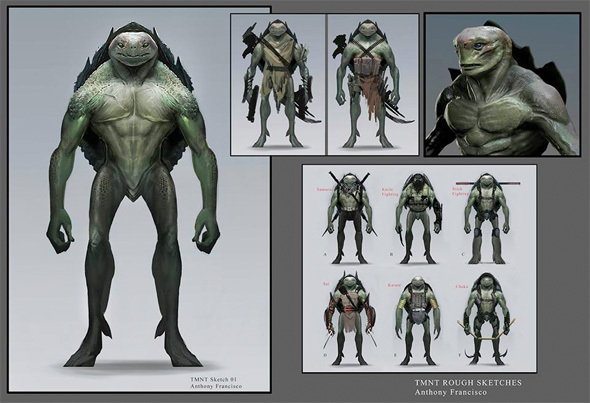 Maybe these designs were inspired by the fact that the original script did call for the turtles to be from another dimension, or at least created by ooze that was from somewhere not of Earth. Either way, these designs are scary, and we're not sure why those two at the bottom are armed with guns, but we're glad that these ended up getting rejected. It's one thing to change the look of the turtles so that they look less like cartoons, but it's another to change their traditional ninja weapons to heavy arms, because hat's just too much. Anyway, the final designs weren't perfect, but that was the least of the problems in the film. Well? What in the 9 realms ? I think he forgot the "ninja" part. TMGT - Teenage Mutant Gunslinging Turtles. I still like the film, you can't make me change my mind Anderton no matter what. I liked After Earth...so enjoy what ever you want! Next I want Biker Mice From Mars! Truly the worst possible design they could have come up with. Wow, utterly speechless. These look as atrocious as the concept art for the dino/humanoid hybrids for the JP4 idea. LOL! I pray to Zeenu they got rid of those dino sapiens. I could not handle a feint. I think everyone is forgetting the original TMNT was based on a pretty dark and serious comic book series. In that type of sense these designs would have worked perfectly. They are more realistic and I like how it's a departure from there typical designs, it's just more bold and stands out better. The only reason I can understand people hating them is because it looks different. I don't think anyone needs to be reminded how much of a departure TMNT took from the original comic book to the more goofy and comedic cartoon which set the standard for what people know TMNT as only today. I agree but these are gnarly...in a bad way. GROSS! It looks like the friendly aliens from FALLING SKIES. 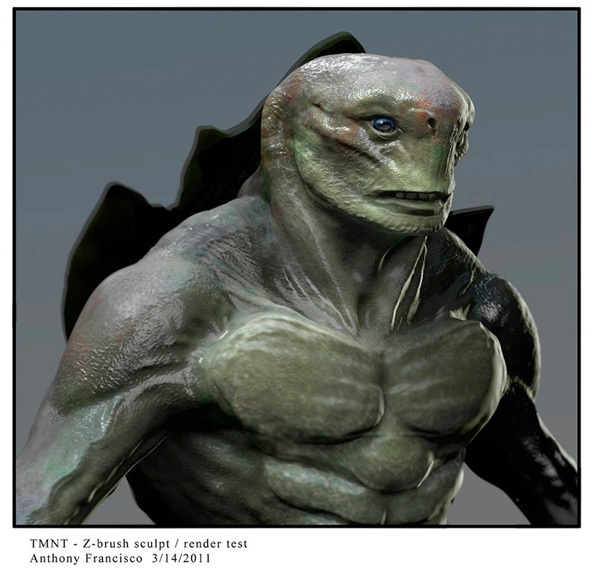 The bottom one's head is the best look turtle IMO it looks more like the beak turtles have. Opposed the the mouths with teeth they have had in the past and currently. Thats always bothered me about them, Turtles don't have teeth. They should save those for a turtles horror movie.